Searching for way to use iMessage on Android? iMessage for Android become very easy with these 3 working method. 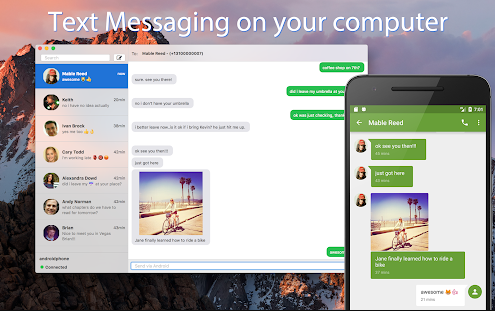 If you want to use iMessage for Windows then we have already shared a guide for that. iMessage is famous for the iOS devices as it has features like Apple Pay Cash, audio calling, video calling, Animoji and many more. With all of the outstanding features, one can easily express their words and feelings. But the bad news is it is not available for iDevices. So many users ask can I get iMessage on my android due to its encrypted with security and great features. But if you have the right software, little bit technical knowledge and the right type of pc and guts to experiment, then you can get iMessage for Android. Apple’s iMessage has the best effects, and features that are exclusively available for the iOS and macOS devices and this is the main reason it is not available for Android users. So the one way to use iMessage on Android is weMessage. How to Use iMessage on Android Phone? 1 How to Use iMessage on Android Phone? 1.3.1 Happy iMessaging on Android! 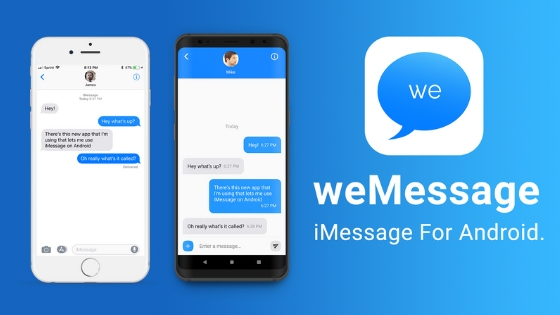 weMessage is a smart app that deals with the security of apple for iMessage. But to set up, it is not a game of tech beginners. There are many complex steps and configurations involved during setup. But, if you want the imessage app for android anyhow then here are the steps to follow. Open your Android device and go to the google play store. From the search bar, find and install the weMessage app. After installation completes, launch the app and click on the continue option. A popup window will ask the permission to access the text from your device. Allow it. With it permit the app to modify the settings of the system. Next, you need the IP address of your mac. You can find it by following the path given here: System Preferences >> Network >> Advanced >> TCP/IP>> IPv4 Address field. This field is your IP address. Now enter the Ip address in the weMessage Android app, iMessage email address, and the password and click on sign in option. As you click on it, you can see the conversation screen on your android device that let you send iMessage from android. First, install java on your mac so that you can use weMessage. Check it by following the path: Applications >> Utilities>> launch the Terminal app (it is pre-installed on Mac) >> Type java >> click return. If it does not shows any problem, then your mac has java in it, but if it shows any error, then your mac doesn’t have java in it. In the second case download the latest version of java. Now, download and installs the weMessage program. To install the file, double click on downloaded file and if it shows an error, then go to Apple’s System Preferences. You will find it on the upper left corner of the mac screen. Go to Security & Privacy >> General >> Open Anyway. Now the user has to enable Accessibility features from the Mac. For that go to System Preferences >> Security & Privacy >> Privacy >> Accessibility. In the accessibility menu, click on the lock icon and unlock the settings. If the option is prompted, then you have to enter the login password of the mac. Next, click on the plus (+) tab and go to hard drive option. Here go to Applications >> Utilities >> Terminal >> Open. Now, you can see the run command, double click on it to launch it. By this way, you can launch a Terminal window. In this window enter the iMessage email address and password. If you want to know another way to use iMessage on Android then “SMS for iMessage” (iChat) Android app you can use. This is available for free of cost and its allow to send you up to 5 message in a day. Thats the good news right! but if you want to send more then 5 message in a day you need to go with pro version. How does “SMS for iMessage” (iChat) Android App works? This app allow you to send text messages between Mac and Android phone. First all you need to download it from the link given above then you need to create your account and add your account to iMessage. Best part of this app is you don’t any other app to access iMessage. The app store your message for 3 days and after that the message got deleted automatically for security reason. It is all about iMessage for android download. The steps are complicated, but if you follow it properly, then it will surely configure on your device with any problem or errors. In case if you stuck somewhere else, then ask for the help, as we are here to help you only. Thank you!